H is for... Harry Potter. With a series of sets tied into the early movies and a video game on the way for 2010 -- this combination is magic. H is for... Horse. So far my attempts to construct anything equine have always resorted in a camel -- a camel that I pretend is a horse. H is for...Henry Jones Sr. Any minifig you can purchase that allows you to do a poor Sean Connery impression is one to keep. Say it with me, "Indiana was the dog's name." H is for...Hair. Who knew that female minifig hair could be rare and coveted? But when you're searching for variety for a MOC, it's nice not to have everyone with a bowl haircut. H is for...Hook. This is half the reason to purchase the LEGO pirates sets (no pun intended). 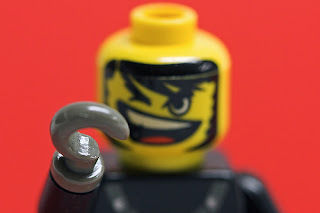 Sadly, anyone with a hook is a bad guy. I apologize to my hook readers. Please do not slam your pirate hooks onto the keyboard with frustration. It will only impale the keyboard, further compounding your anger. Indiana Jones. The dog's name. Disneyland trivia. If you ride the train around Disneyland, watch for a dog house with a familiar name written on it. This is better than the Pirate's alphabet. Rrrrr!